This Holiday Birdfeeder is a great kids craft for the winter time (or anytime). 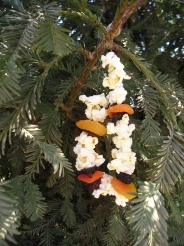 When you're stringing popcorn for the Christmas tree, put some aside and 'feed it to the birds'! This craft involves threading with a needle; since each child has different levels of dexerity you'll need to judge whether or not a specific child can do this craft safely. 1. Thread your needle with your fishing line. Thread on popcorn and dried fruit. 2. Hang or drape on trees and along fences and watch the winter birds come into your yard (you may even have other little creatures eating from your feeder as well!). Click here to find more Birdfeeder Crafts like the Holiday Birdfeeder!